Wish you were here so we could celebrate properly! LOVE YOU ALLIE! 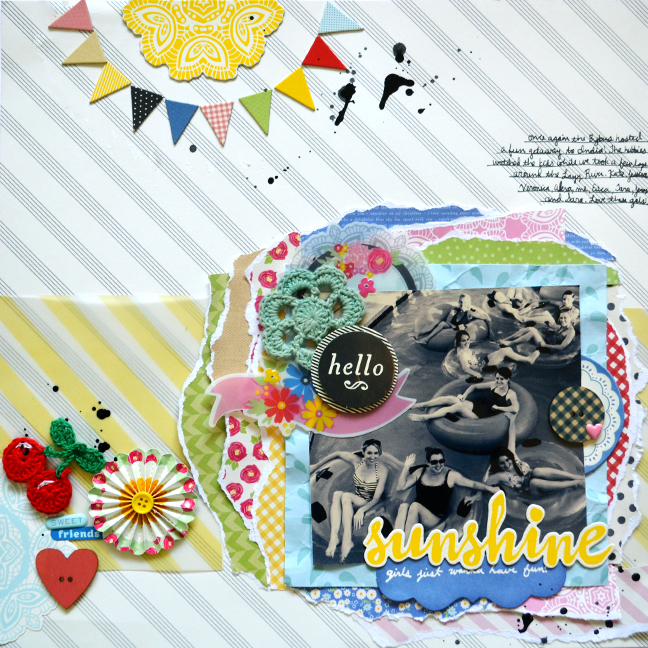 Anyway, back to business, I have a pair of layouts up on the American Crafts blog today! Journaling says: At 8 months you are finally taking naps in your crib but don't ask about how you sleep at night... You are so affectionate and sweet. You love having your picture taken. Everything goes straight into your mouth! Now teeth yet. You would eat all day long if we let you. You refuse to use your legs to stand. Finally rolling from front to back. Happy-go-lucky! How to: Die cut a large doily from scrap cardstock, place it over a robin's egg blue cardstock background, spray over it with aqua mist, then remove the doily mask. 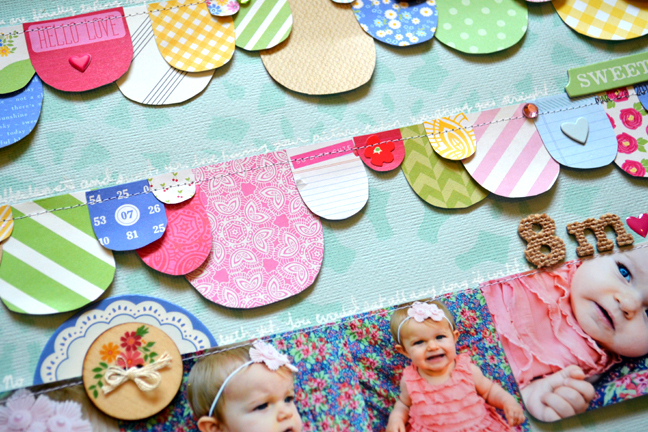 Trim rounded pennants from patterned papers and adhere them in three rows along with a row of photos between. Round the bottom corners of the photos to match the rounded pennants. Stitch along the top of each row. Add clusters of embellishments (such as wooden buttons, jewels, a crocheted doily, sequins, chipboard elements, stickers, and more) and make a title on the right edge using canvas Thickers - replacing a letter with an epoxy heart sticker. Write journaling with a white pen above each row. 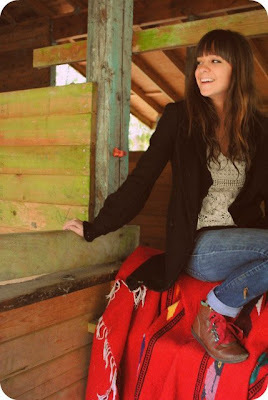 Journaling says: Once again the Bybees hosted a fun getaway to Indio! The hubbies watched the kids while we took a few loops around the Lazy River. Kate, Jessica, Veronica, Alexa, me, Erica, Tara, Jenny, and Sara. Love these gals! How to: Mat a sepia photo on raindrop paper, adhere it on the bottom right corner of a striped layout background, then tuck torn strips of patterned paper under the edges to create an intricate photo mat. Place half of a chipboard doily on the top left corner and surround it with chipboard triangles. 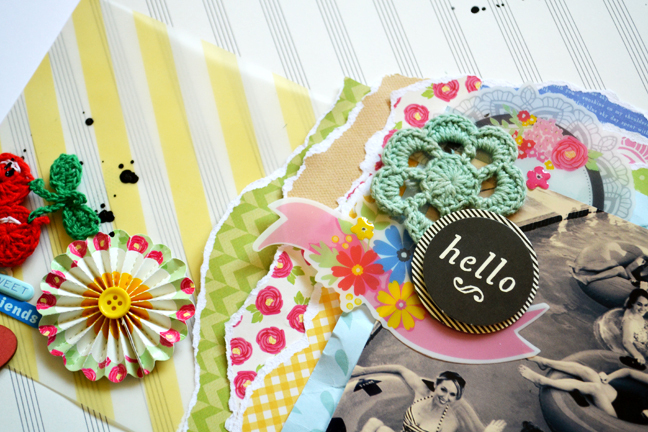 Place clusters of embellishments (such as crocheted shapes, an accordion paper flower, wooden buttons,m stickers, vellum die cuts, etc) around the layout as shown. Place a large chipboard word at the bottom of the photo. Write a title with a white pen on a label die cut and tuck it under the word. Drop India ink across the layout and let it dry. Write journaling on the middle right edge with a black pen. These are gorgeous!! LOVING the colors and the banners on the first one!! Happy birthday to your Sis (she shares one with my Mama!!) and happy early birthday to you!!! Love these layouts! Have a happy birthday tomorrow! I love what you did with your layouts! Happy Early Birthday! I love that layout for Jane's 8 months! So cute! !